Welcome to one of the most unique golf courses in the world! Located on tidelands that are occasionally covered by high tides (except during the summer), you can golf in the splendor of Alaska. The tees and greens utilize artificial turf in order to avoid using toxic materials in this sensitive area and to provide a longer playing season. Read more about our services, rates and location. Please contact us via email or at 907-766-2401 or 907-314-0760 with any questions. It is located entirely on land classified by the U S Army Corp of Engineers as wetlands. It took seven and one half years to get the required permits to build the course. It is situated in the most beautiful setting of any golf course in the world. Salmon and trout use rearing streams on the course. The course is a links style course. The area is undergoing isostatic glacial rebound. The area is rising about 0.9 inches per year in relation to sea level because of glacial melting and decreased weight pushing the earth's crust down into the magma. Due to the environmentally sensitive nature of the area, pesticides and herbicides will not be used. Moose and bears frequent the area even though it is uncommon to actually see them. Their tracks are seen daily. Because of environmental considerations, the course will never have perfect grass, fairways, and greens. 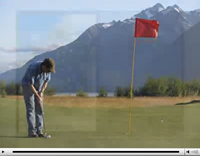 With summer daylight playing hours from 3 AM to 10 PM, Valley of the Eagles Golf Course is a must-do stop on your Alaska itinerary. The two most common expressions used when people visit the course are, "WOW" and "AWESOME".